Wild animals are, well… wild! Just the other day, I wrote about the South African farmer who got mauled by his “pet” hippo, Humphrey. 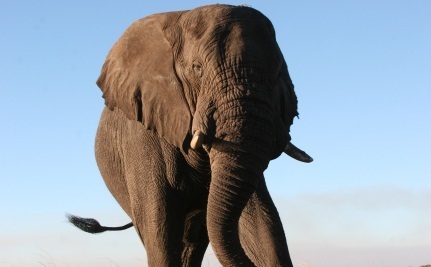 Now another South African man has been killed by an elephant. 67-year-old Mike Dobson and his wife Ling were walking in the bush on their friends’ private game farm on the Shashe River in Botswana while on holiday when the incident, which has been described as a “once-in-a-lifetime freak accident” that happened “in the blink of an eye,” occurred. Dobson was loaded into a car and rushed across the South African border some 60 kilometers away, but he could not be revived by paramedics once they reached them and died of his injuries. Mr Dobson, who was known for his volunteer work at a childhood development center and a children’s feeding scheme in his hometown of Knysna on South Africa’s Garden Route, loved the bush. when you do this kind of work you should allways have dog with you one that knows the bush. so he can warn you in time or distract a wild animal long enough for you to escape in time the dog will be fast and agile enough to not get hurt himself but he can save your life. Sad! But it is wild animals and it is their habitat. So humans have to be careful when moving around in those ares. But it is still sad. "Once-in-a-lifetime freak accident", and Dobson was where he wanted to be, enjoying the game farm -- so though sad, he probably knew more than most, that one takes one's chances when on the animals' turf. My respects to his wife. I hope that this is noted that it is a freak accident and that they don't go out on a hunt to kill this beautiful animal for her being scared. Elephants are very protective of their own and will do anything when they think they are being threatened esp. the Matrioct's who really bond together to watch out for anything they think might harm them. Stupid people. They should know that's what happens. Nature is nature. You take the risks when entering the animals land. Sad story. Always dangerous to be around truly wild animals especially big ones. It's sad that that has happened, however, it's a freak accident. I just hope that this beautiful, majestic animal it's going to be hunted down and killed. Sad to say, but this animals environment was invaded. We humans need to be very careful how we tread when we are in the natural environment of animals. If people would leave WILDLIFE alone and not swim, play or hunt them this would be a much better planet to co-exist on! This is what happened to Steve Irwin; it was a freak accident. It happens but when wildlife is the cause of human's dying, it makes the news. People get gored by bulls and stomped by pet horses. Life happens. Death is always right around the corner.